Haemolytic anaemias are caused by increased destruction of red cells. The red cell normally survives about 120 days but in haemolytic anaemias the red cell survival times are considerably shortened. There is no definite explanation why red cells are removed from the circulation at the end of their life-span. 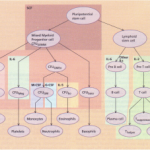 Breakdown of normal red cells occurs in the macro phages of the bone marrow, liver and spleen. Shortening of red cell survival does not always cause anaemia as there is a compensatory increase in red cell production by the bone marrow. 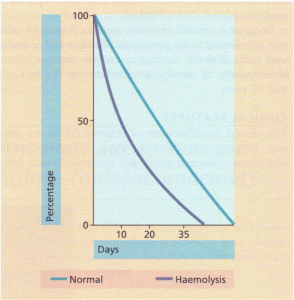 If the red cell loss can be contained within the marrow’s capacity for increased output, then a haemolytic state can exist without anaemia (compensated haemolytic disease). The bone marrow can increase its output by six to eight times by increasing the proportion of cells committed to erythropoiesis (erythroid hyperplasia) and by expanding the volume of active marrow. In addition, immature red cells (reticulocytes) are released prematurely. These cells are larger than mature cells and stain light blue on a peripheral blood film (the description of the appearance of the blood film is polychromasia). They may be counted accurately as a percentage of all red cells on a blood film using a supravital stain for residual RNA e.g. new methylene blue. In most haemolytic conditions red cell destruction is extravascular. The red cells are removed from the circulation by macrophages in the reticuloendothelial system, particularly the spleen. affected by haemolysis, using labelling of red cells with 51Cr. When red cells are rapidly destroyed within the circulation, Hb is liberated. This is initially bound to plasma haptoglobins but these may soon become saturated. Excess free plasma Hb is filtered by the renal glomerulus and enters the urine, although small amounts are reabsorbed by the renal tubules. In the renal tubular cell, Hb is broken down and becomes deposited in the cells as haemosiderin. This can be detected in the spun sediment of urine using Perls’ reaction. Some of the free plasma Hb is oxidized to methaemoglobin, which dissociates into ferrihaem and globin. Plasma haemopexin binds ferrihaem but if its binding capacity is exceeded, ferrihaem becomes attached to albumin, forming methaemalbumin. 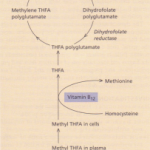 On spectrophotometry of the plasma, methaemalbumin forms a characteristic band; this is the basis of Schumm’s test. The liver plays an important role in removing Hb bound to haptoglobin and haemopexin and any remaining free Hb. • Excess urinary urobilinogen (resulting from bilirubin breakdown in the intestine. Demonstration of shortened red cell life-span: Red cell survival studies using slCr-labelled red cells are useful in complicated cases and also for quantitation of the severity of haemolysis. The dominant site of red cell destruction can be shown with external body counting over the liver and spleen. 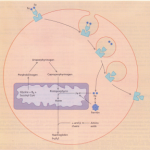 The fate of haemoglobin in the plasma. INTRAVASCULAR HAEMOLYSIS. 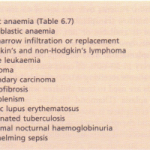 This is suggested by raised levels of plasma Hb, haemosiderinuria, very low or absent haptoglobins and the presence of methaemalbumin (positive Schumm’s test). Various laboratory studies will be necessary to determine the exact type of haemolytic anaemia present. 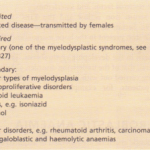 The causes of haemolytic anaemias are shown.